I’m a mental health nurse and I know how challenging the role can be at the best of times. So when Canterbury DHB announced that, because of funding cuts being forced on them by the current Government, they may have to cut funding to mental health services I was very worried. Today is the anniversary of that awful 2011 quake. My thoughts are with the people of Christchurch and with the families of those who were killed. My thoughts are with every person who still bears the scars of the earthquakes, be they physical or mental. Things are pretty tough in Christchurch and I fear they’re going to get tougher. I have been talking with some of my Christchurch-based mental health colleagues over the last couple of days and I share their concerns. The anniversary of the February 2011 quake is today. This, along with the recent earthquakes is re-traumatising people. The long-term prognosis for mental health in the city is deteriorating, because young people aren’t getting early intervention from specialist mental health services. There is a rise in young people who have little resilience left and just aren’t coping being referred onto adult mental health services. The referral rate to child and adolescent mental health services has doubled, and there’s been a huge increase in presentations to the Crisis Resolution Team. It’s really hit home in the last 12-18 months. People are moving from place to place, relationships are breaking down, and children’s mental health is suffering. Some Special Education Services staff have been told not to give a diagnosis of PTSD to children they are working with, partly because there is not enough funding to treat them. People with long-term, chronic mental illness have been destabilised after being ousted from their council house, losing the support of nearby friends and familiar shops. There has been an increase in Alcohol and Other Drug (AOD) use. 100,000 people have come to Christchurch for the rebuild. The guys are working up to 16-hour days, burning out and turning to alcohol and drugs. A lot of them are turning up in mental health services. The DHB is expected to absorb that increase out of existing budgets. There is noticeable rise in mental health problems among Canterbury farmers. There are long delays to be seen in specialist mental health services, especially for new referrals and especially for children and young people. There is a waiting list at Whakatata House, a community mental health service for children and families. The biggest and widest impact of funding cuts has been felt by NGOs who support people in the community, so they don’t become so unwell that they need specialist services (this trend is expected to continue). All sexual assault support services were closed last year, along with Relationships Aotearoa. Recently, The Pacific Island Trust has gone, and the drop-in centre at Latnam House has been forced to shut its doors. Even some DHB mental health services have shut down. The Day Programme at the Youth Inpatient Unit at Princess Margaret Hospital closed about a month ago. Caseloads for community mental health nurses are 30-40. This means nurses do not have enough time to do their job. Case managers are staying at work until 6pm routinely – doctors even later, until 7 or 8 in the evening. This is overtime is unpaid. Running a service on the goodwill of staff in this way is not sustainable. Staff in community mental health were recently told that they’re not allowed to organise taxis any more, to help clients get to appointments. Now the next cut which they have been told is coming, is that they are going to lose some of their DHB cars, so staff will be less able to visit clients in their homes. The increasing use of “Level 2 specials” (ie. one-to-one care in the inpatient unit, for high needs service users) has meant that nurses have to push to get the extra staff they need. Staff are being cut by not filling vacancies. Staff are having to deal with the same issues as the rest of Canterbury: dealing with EQC, fighting Fletchers, moving house. People are tired. All the staff are on edge. Some say it’s almost like they are suffering from post-traumatic stress themselves. There is huge staff turnover. Since last weekend’s earthquake, three staff in one ward have resigned. They say they are looking for work in other regions and who can blame them? All the people I spoke to said they and their colleagues are dismayed and disgusted at this Government’s decision to not adequately fund Christchurch’s mental health services. It doesn’t have to be like this. We all chose to prioritise some things in our lives over others. And the Government is no different. They have not prioritised the health and well-being of Christchurch people. I guess the good thing about priorities is that they can changed. I’d like this Government to prioritise mental health services in Canterbury. I urge them to do it! Tags: Christchurch, mental health, nursing, Stress | Permalink. Tomorrow, the 4th of February, the Government is signing the Trans Pacific Partnership Agreement (TPPA) in Auckland, along with eleven other countries. I’ve been travelling around for the last few weeks and talking about why it’s important we walk away, for our health and our human rights. This ‘partnership’ agreement they are signing is not an equal or healthy one and I’m really worried. I’m worried that Pharmac is going to have to pay more for essential medicine. If just one company holds a patent for a longer time, they can charge whatever they like – for example, up to $300,000 per patient for a cancer drug like Keytruda. This could cost us hundreds of millions of dollars in the long run and people we love could miss out on care they need. I’m worried that foreign tobacco companies can demand they ‘help’ us write the laws on tobacco control. Even if they can’t sue us directly, they can ask their own Governments to do it for them. We need to have the right to make our own laws. I’m worried other companies, like Coca-Cola, or casinos, or oil companies, will use this agreement to go after a small country like us if we do things against their interests. Even law changes like removing the GST on fresh fruit and vegetables could be at risk. Protecting our own health should be our decision, not theirs. I’m worried for our hospitals. If DHB services are contracted out to private companies, it could be really hard to get these services back in the future. Under the TPPA, we couldn’t do anything that ‘favours’ services owned and supplied by the people, versus for-profit companies. The American health system has been taken over by huge multi-national insurers, and we don’t want to end up in the mess they are in! Thankfully, it’s far from over. Although the Government is signing the agreement tomorrow, they have to change a lot of law in parliament for it to begin. Every time they do this, we have the opportunity to tell them it’s not ok. We need them to know it’s a really unpopular move for any Government to sign away our rights. Keeping our independence to decide what’s healthy for our country is keeping our strength. Nurses and health workers in America, Australia and around the Pacific Rim are sending their governments the same message. Tomorrow I’m standing with them, against the TPPA and for partnerships which protect health and human rights, and I’m asking you to join me. Details of the rallies against the signing can be found here. 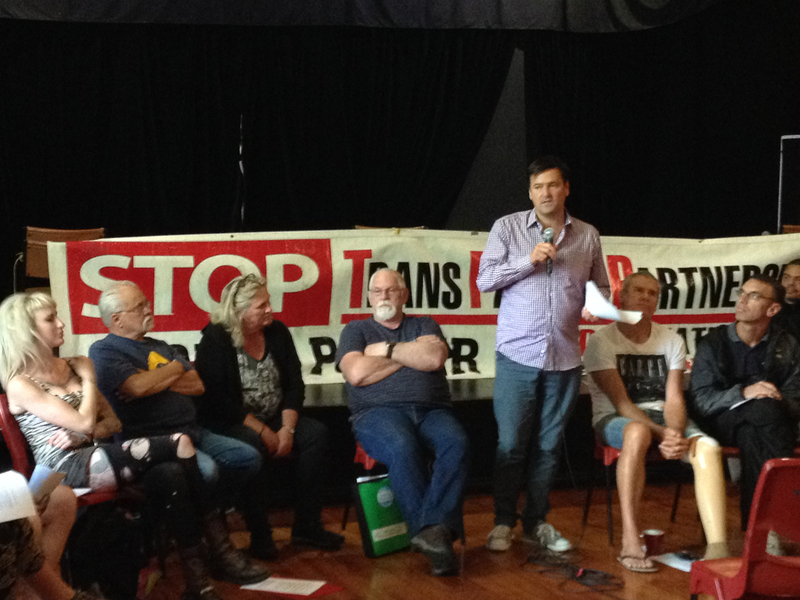 If you want to read up on the TPPA text in more detail, check out my speech notes from the speaking tour on my blog. Tags: advocacy, collective action, human rights, TPPA | Permalink.